The following is based on the experience other crabbers have shared over the internet about their Violas, as well as other web research. Violascens need temperatures and humidity around 85*F/29.44C and 85% like most other land species. Violascens are comfortable in a mix of about 5 parts sand to 1 part bio-matter (such as coconut fiber). Each Violascens should be able to dip their shell into a pool of dechlorinated fresh water and an ocean grade salt water. 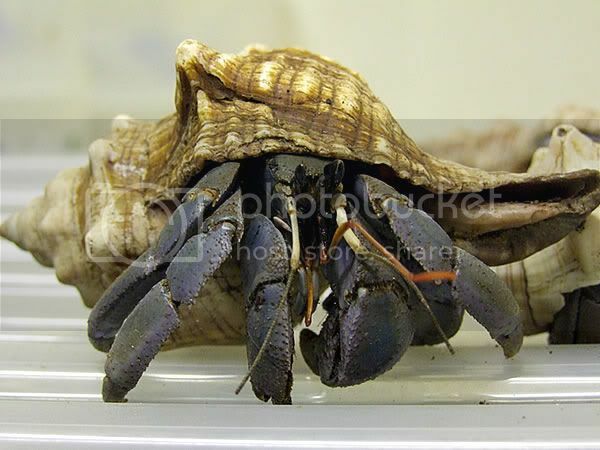 Violascens are known to be the most aggressive of the land hermit crabs and actually have what's called a "predatory" claw. In the wild, they actually hunt for other small invertebrates & fish along the shoreline. Violascens love to climb and hang out in trees, so be sure to have plenty of things for them to climb on and sleep in. Violascens should be kept in a tank by themselves as they will dig up molting crabs and eat them.